Surgical Attractions are equally concerned with the care you receive during your recuperation as they are with the care you receive during your hospitalisation and surgery. Therefore providing you with a caring and compassionate representative /companion to meet you at the airport, settle you into your hotel, accompany you to your medical appointments and assist you at the hospital is only one aspect of our service. We also choose recuperation establishments that boast the highest calibre of caring personnel who understand you are away from your home and loved ones and are, as a result, dedicated to being there for you and attending to all your needs. The fact that all our luxury hotels and guest lodges are also chosen for their exceptional comfort, style, cuisine and fine wines is a further example of the importance we place on your care. Winner of the prestigious World Travel Award 2002, Saxon makes a world class statement of ethnic elegance and can now officially claim to be the best boutique hotel in the world. Nestled in a quiet, secluded, lush green and leafy suburb of Sandton Johannesburg, it is the hotel at which Nelson Mandela chose to relax and edit his highly acclaimed autobiography “Long Walk to Freedom”. The beauty of Saxon’s exterior is only matched by the stylish splendour of its interior which boasts accommodation, facilities, cuisine and wine that dreams are made of. Enter Saxon expecting to be impressed and leave knowing there is a hotel in this world that can exceed your expectations of perfection. Created in the image of a Mediterranean hillside village, The Westcliff cascades down through landscaped gardens in a series of picturesque ‘villas’, surrounded by lush greenery, sparkling fountains and cobbled pathways. A haven of peaceful seclusion The Westcliff, which enjoys stunning views of elephants strolling through the Zoological Gardens below it and the majestic Magaliesberg mountain 50km away from it, combines modern facilities and beautiful accommodation, fine cuisine and wines with Westcliff's poolimpeccable service. When you know you deserve something special in life you’ll know you deserve a stay at The Westcliff. Situated at the foot of Cape Town’s extraordinary Table Mountain, The Mount Nelson is continually voted one of the top travel destinations in the world. Its breathtaking views, parklands and world-renowned rose gardens are a constant draw card to overseas visitors who are also able to enjoy complete peace and seclusion courtesy of beautiful accommodation - offering private gardens and facilities. Utilising the region’s abundance of fresh produce, seafood and distinctive spices the cuisine at The Mount Nelson also promises to satisfy the most ardent gourmet. 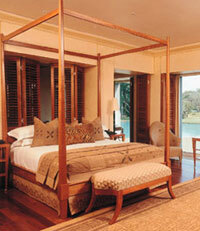 In fact everything about The Mount Nelson promises to satisfy whatever you personally desire in a hotel. Just 15 minutes from the city and close to all the wonders of Cape Town, magnificent Highlands, classified as a National Monument and boasting beautiful antiques and object d’art, has been fully restored. Originally built by Sir Herbert Baker for Judge Searle, the first judge president of the Cape, it has played host to such luminaries as Arthur Conan Doyle, Olive Schreiner and Percy Fitzpatrick to name a few. Today visitors can enjoy the same hospitality, delicious food, fine wines and pampering as was extended to guests in years gone by - as well as modern, beautifully decorated rooms specially designed to cater for your total privacy and personal needs. If you’d like to experience a hotel with a special difference, experience Highlands. All our guest lodges are specially selected to offer our clients secluded, private accommodation and facilities in picturesque surroundings. Caring and compassionate personnel are also a pre-requisite in order to attend to all our clients’ special needs and requirements. (Photographs courtesy of Foxwood House, Highlands, Saxon, The Westcliff and The Mount Nelson in association with Rennies Travel).